ContriveDallasite wrote: It's a small step forward, but no way this parking garage would have retail 5+ years ago. The exposed garage with no masking is atrocious. Absolutely cheap, kills the charm of the historical buildings nearby. It really does. Parking garages are the Apex of brutalism. Without even trying. The expansion is only on part of the Elm Street garage. You can simply look at the google maps and see its two garages merged together with the part that services Comerica Tower is getting an expansion. Is that the finished product? Looks like it's still under construction. Essentially, yes. There will be a sign that says parking per the render. But other than that; what you see is what you get. Concrete and wires. ^Ugh....wish they would have at least bricked it to make it look a bit more like the building. Tnexster wrote: ^Ugh....wish they would have at least bricked it to make it look a bit more like the building. That's actually worse. It's probably way too much garage space too. I wish they would at the very least cover these things up or even make them a living wall. Just passed the new one on St. Paul across from First Baptist, and I can't help but notice how awful Federal Plaza looks. The city actually gave this developer right of way over Wenchell Ln and didn't ask for a single thing in return, not even a light fixture or a decorative feature facing the park. I guess the most we can expect is they'll let someone paint a mural on this wall. Why does Dallas allow these exposed garages with wires?! So infuriating. The same crap happened with the cheap hotel across union station facing dealt plaza. The Butler's parking garage has been there for over 40 years, so it has a good excuse. Everything else, agree. I also find it hilarious that we have a thread dedicated to parking garages. This thread alone epitomizes the cultural significance of Dallas' carcentric mentality. On another note, aren't many of these newer garages designed to be later transformed into liveable spaces? joshua.dodd wrote: On another note, aren't many of these newer garages designed to be later transformed into liveable spaces? I think the fate of the parking garage moves at a very slow pace, especially when stacked up against the forum's favorite topics. 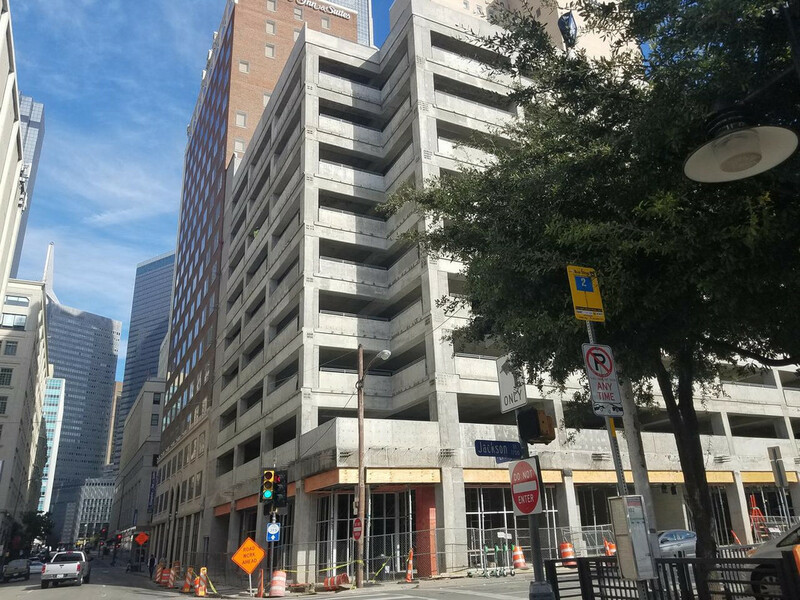 I'm not too concerned downtown one day will have to come up with a plan to address derelict parking garages idling toward demolition through neglect. Isn't Plano the first city to start reviewing parking requirements, thanks to a review from Granite? It'll come time in Dallas City Council to allow for development without too much parking, especially residential and hotel. If they are, I haven't heard a single thing about that. I've been saying for a while that this should be the standard, but, to my knowledge, I've only seen examples of this in other bigger cities (I seem to recall a garage in LA that was built with the intention of being converted sometime down the line). This honestly seems like a no brainer to me. Forget digging underground, build a aesthetically pleasing garage above ground that can be later converted into residential. In the short term, it won't be ideal, but it'll save costs/time being above ground, give the building that higher parking ratio, and give us more room to grow in a decade or so. I'd happily put up with more above ground parking if it were designed this way. tamtagon wrote: I think the fate of the parking garage moves at a very slow pace, especially when stacked up against the forum's favorite topics. I'm not too concerned downtown one day will have to come up with a plan to address derelict parking garages idling toward demolition through neglect. Isn't Plano the first city to start reviewing parking requirements, thanks to a review from Granite? It'll come time in Dallas City Council to allow for development without too much parking, especially residential and hotel. I wonder if the parking garages of today will eventually become 'urban trailer parks'. After-all, RVs are basically studios on wheels, and, once we have self driving RVs, I can see them becoming popular again. I guess they would have to shake off the negative connotation and make them trendy/cool somehow. tamtagon wrote: It'll come time in Dallas City Council to allow for development without too much parking, especially residential and hotel. I mean, why not allow it now. I highly doubt there would be any interest from developers in very low- or no-parking buildings at the moment, but why wait until after the market has change to allow it? No point in being reactive instead of proactive. Heard a rumor that after 24-Hour Fitness leaves the Bryan Tower garage, the new tenant will be... nothing. Bryan Tower is supposedly expanding the parking garage to include at least the two floors occupied by the gym. To attract more tenants and what not. The Hampton Inn/AC Hotel/Residence Inn garage, as of a week or so ago. I don't know if the white at each end is the color that will be used for the outside or if that's a primer coat. Well, at least it has ground floor space. That it has. Not sure how much luck they'll have filling it, after not having any takers yet for the corner spot by the Hampton (the Fireside Pies tease notwithstanding). If that retail space was built for a restaurant use, it may be easier to lease than the Commerce storefronts here and at Mercantile Commerce that never got filled. The fact that there's now dedicated parking should help. Tnexster wrote: Well, at least it has ground floor space. R1070 wrote: Apparently there are some big 2019 announcements coming for the big Trammel Crow garage regarding the next phases of development. Trammel Crow you say?...let me guess, Prolly another garage on top of the garage. in a world quickly running out of fossil fuels supplies I think it is ridiculous to think we will not need parking because these vehicles will be driving about constantly looking for patrons...It is getting to the point when I ask the question - why humans needed at all - we just get diseases and have problems...just let machines take over. I am glad I am in my fifties and won't have to endure this dismal world that is being created of an Amazon only environment. Why go to a restaurant - we will just all wear IV's that feed us supercharged foods or even better we will have batteries implanted in our bodies and we won't have to eat at all! I like some things the way they are and driving a car is joy and privilege that should be preserved. doubdfw67 wrote: in a world quickly running out of fossil fuels supplies I think it is ridiculous to think we will not need parking because these vehicles will be driving about constantly looking for patrons...It is getting to the point when I ask the question - why humans needed at all - we just get diseases and have problems...just let machines take over. I am glad I am in my fifties and won't have to endure this dismal world that is being created of an Amazon only environment. Why go to a restaurant - we will just all wear IV's that feed us supercharged foods or even better we will have batteries implanted in our bodies and we won't have to eat at all! I like some things the way they are and driving a car is joy and privilege that should be preserved. Of course... Clothes lines didn't kill 30,000+ American's annually. Jokes aside... There are places where driving is truly enjoyable. But, the city is definitely not one of them.